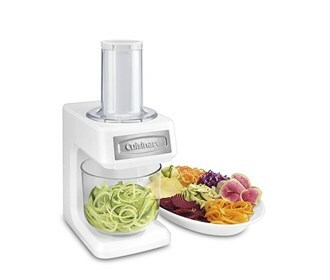 The Cuisinart Prepexpress Spiralizer Slicer Shredder is a 3-in-1 kitchen helper that helps to simplify food preparations. It allows you to effortlessly create wide ribbons or crinkle-cut spirals of fresh zucchini and apples, and thin or wide butternut squash or beet “spaghetti.” The combination of these three can produce 8 different cuts of food. 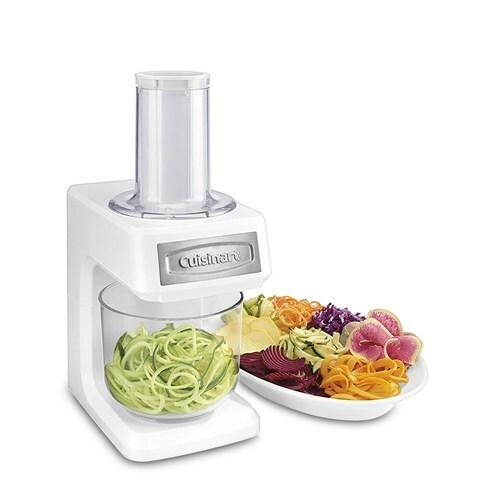 The Cuisinart Slicer, Shredder And Spiralizer has many exciting features for users of all types. You can extend the lifetime of your Cuisinart Slicer, Shredder And Spiralizer with the purchase of a FactoryOutletStore Factory Protection Plan. See the Cuisinart Slicer, Shredder And Spiralizer gallery images above for more product views. The Cuisinart Slicer, Shredder And Spiralizer is sold as a Brand New Unopened Item.